Dong Van market and sessions located in the Old Quarter of Dong Van town in Ha Giang Province. 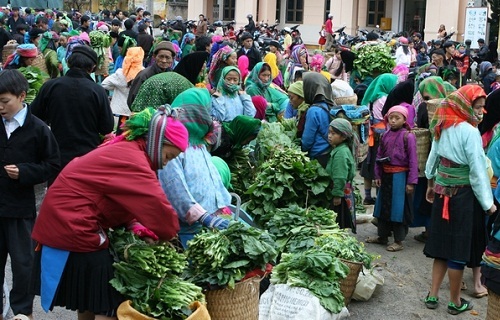 No one knows the first time for appearing Dong Van market but on every Sunday, people of the regions, including Hmong, Tay and Bo Y, which come here to exchange, purchase or just to get a fun or socializing. And they created a unique fair in this rocky plateau. The Dong Van market always starts on time in the morning, and the mist is still wet by the climatic characteristics of the region. In Dong Van town, even in the summer, at 5AM, it was still a bit cold, dark and fully mist. From the early morning of Sunday, on the streets in the Dong Van town, the people in the colorful costumes quietly go to the market. Guests can catch any mother, and her sons or daughters go in the misty morning. The mother takes a heavy basket on her shoulder; in front of soothe, it is asleep baby, leaving chubby bare feet out. Going next to that mother is a reaching adult baby; he is high as the mothers hip; his legs have the plastic boots; and strangers will look on curiously. Sometimes, visitors can see a Hmong ethnic youth alone, hugging a chicken to bring to the market for the sale; the journey to market can be more than ten miles. Recently, with an improved standard of living, a number of people who had motorcycles; and they're happy to drive a motorcycle to take his wife and children with "the special basket" contains the agricultural products to go faster to the market. Recently, the Dong Van market has been moving another larger location, but it's still in town. The old market is built by the brick walls; it is large, red-yellow; the roof is covered by the black stone tile; and the floor is a base of the large boulder which has been neglected. A new market was built by the concrete; and it is wider, but is not as beautiful as the old one. New markets also lack the landed embankment kitchen; and the pans usually contain the Thang Co food (This is a very especial food of local ethnic people). However, it is still crowded and noisy. At the markets gate is the pork-sale section. On the way, it is continuously the Quay rice cakes are put into the honey, the flexible boiling rice... It is very noisy with many buyers and sellers. When the customers appear, the sellers turned Quay into the honey pan with a stylized technology; and then, they were wrapped in the papers; then, they offered to their clients. The sellers continuously said that their flexible boiling rice was aromatic and hot to attract the customers. The exciting five-color flexible-rice is usually yellow, purple, green technology... But recently, some sellers still create the bright hot pink rice, so that travelers should avoid eating this kind. Going into the market, you'll be all warmly invited. Here, you can buy all; they are the sorts of green vegetables, red pepper, yellow corn and shining boiled chestnuts and even a cat in a basket or mobile phone. If the tourists are from Hanoi and want to attend this market, visitors have to start at least a day before, because Dong Van market is about 500 kms far from Hanoi. However, in the Dong Van market, visitors come here are not only domestic tourists, but they are also many foreigners. If visitors are foreigners and want to go to the market, visitors need a visa to enter Vietnam. This procedure is the best at Noi Bai international airport. Then, guests stay in Hanoi and book tours upon request to go to this place. 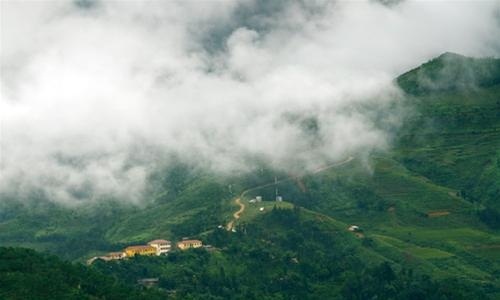 Because, in most cases, this is the best and fastest way, except tourists from China, they can enter through the Thanh Thuy border in Ha Giang Province to reach this market.